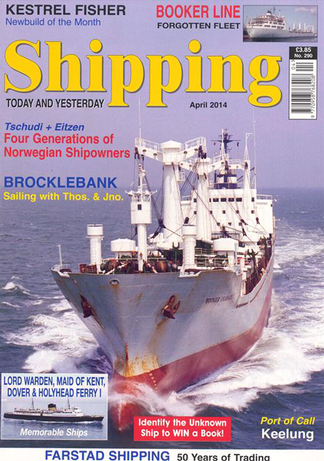 A subscription to Shipping Today & Yesterday magazine is ideal for the shipping enthusiast, with every issue offering up-to-date information, topical and in-depth historical articles.. Published monthly, Shipping Today & Yesterday magazine includes news about Cruise Ships and Ferries, as well as a host of informative articles on a wide variety of maritime world topics. As the title suggests Shipping Today & Yesterday contains stories and photos of bygone days alongside features of current interest and regularly carries book and DVD reviews. Shipping Today & Yesterday magazine is a specialist magazine, which features many aspects of sea transport including ocean liners, ferries, merchant ships and docks & ports around the world. Every issue of Shipping Today & Yesterday magazine is full of quality photographs, both in colour and black & white, it is ideal for the serious collector or those with a general interest. Shipping Today & Yesterday will appeal to shipping enthusiasts and collectors of shipping memorabilia. Subscribe to Shipping Today & Yesterday magazine and never miss an issue; plus you’ll receive the magazine FREE for you door every month. Buy a subscription today to Shipping Today & Yesterday magazine for you or a friend today. Be the first person to tell us what you think about Shipping Today and Yesterday and you'll save £2.50 on your next purchase!